This is one question that every rejected candidate wants to ask their interviewer. But, they hardly get the scope to do that. The candidate who appeared for the interview was well prepared, answered each question with conviction and was confident, but when the result was announced he witnessed that someone else was selected for the position. He doesn’t have any idea why his name is not there when his interviewers were also impressed with the answers. He felt a positive vibe from the interviewer and that is why he was so sure that he would bag this offer. Now that he is rejected he wants to know what the reasons are, so that he can improve on that. Next time when he appears in an interview he won’t commit the same mistake again. He has the right to question, but who is going to answer his question? Nobody will take the onus of tying the bell around the cat’s neck. When there is something wrong with a candidate, the recruiters know that even if he sails through the interview smoothly, then also, he won’t be selected, they find it hard to tell that to the candidate. Will you be able to tell a person that he is not interesting enough to hang out? No, you would rather prefer to make an excuse of not having enough time or you have an important meeting to attend, to avoid that person. It is hard to say ‘no’ even when the person is not standing in front of you. Like, if someone is sending you friend request time and again, but you don’t know that person well, then will you accept his friend request or would you prefer to turn it down? Obviously, you wouldn’t like to react to that request at all. So, see if you find it so hard to turn down offers that are not very important, then how come you expect the recruiter coming out with a proper answer on why they have rejected you for the position! Even when you feel it is important for your improvement, then also there are some other bindings that restrict the recruiter from blurting out the truth. Honest feedback is hard to get and it is not because the recruiters are doing something wrong, it is just because they are humans too, and they also find it stressful to say why you were rejected. The recruiters don’t find benefit in sharing the reasons of your rejection, instead they have seen every time they have tried to explain things to the candidate, things started getting complicated. Candidates start accusing them of partiality, so to avoid this situation; the recruiters find it easy to dodge the question of why the particular candidate has been rejected. 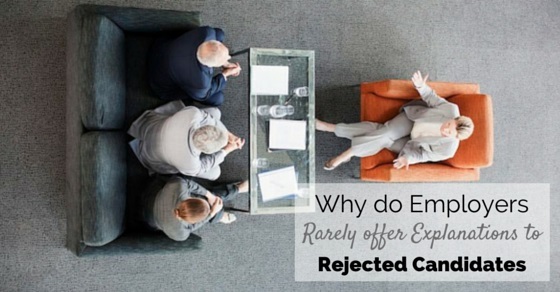 Here are some of the reasons due to which the recruiters or employers rarely offer explanations to their rejected candidates. 1. Why the other candidate is selected? When the rejection letter reaches the candidate, the first question that crosses their mind is why the other candidate got selected. It is no more about why they were rejected and what their shortcomings are. The candidates start dragging down the selected candidate and negativity prevails, which is very much annoying. The rejected candidate can drag you into a lawsuit, if he or she doesn’t like the reasons that you have provided them for their rejection. They might accuse you of favoritism or discrimination, which you will find very hard to prove wrong. You very well know that the reason they are providing is invalid, but how do you prove it. It will take up a long, bitter battle between you and the candidate and there is no guarantee that at the end you will come out as a winner. Therefore, rather than getting into a lawsuit it is always better to steer clear of it by not providing any explanation at all. If you feel that the rejected candidate was good, but not that great, then how do you explain that to the candidate? Another reason for the rejection might be his communication. He wasn’t able to clearly express himself, but if you try to make the candidate understand that then he would start arguing with you, rather than trying to improve his communication skills. His attitude might not be that appealing or he might be too uncomfortable with the company culture. There are several reasons that are not at all easy to eloquent; therefore, it is better to stay away from the explanation part. When you ask one company that why they are not giving any explanation to the rejected candidate, they would promptly cite the example of other companies who are not doing it. You never know how the candidate will react when you tell them the reason why they were not selected? They might accept it gracefully or they might start arguing after listening to the harsh feedback. So, it is much easier to stay away from the feedback path, rather than getting into an embarrassed situation by providing an explanation to the candidate. When there are so many recruiters trying to figure out who will be best suited for the job, then there are multiple reasons cited by each one of them about why the candidate must get selected and why the other candidate must not get selected. There are so many reasons that it is hard to explain all of that to the candidate. How many of us really has the ability to listen to the truth? Most of us assume that we are strong enough to listen to the bitter truth, but the reality is far from that. Once the recruiters reject a candidate and also points out the drawbacks in the candidate, negative thoughts start creeping on the mind of the candidate about the company. This is definitely not what the company would like, so they stay away from commenting on anything negative. Whatever might be the reason, companies prefer to steer clear of any kinds of controversies by providing the candidates with an explanation about why they were rejected.